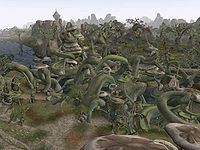 The town of Llothanis is a bustling Telvanni trading town that spans the Nebet Bay. Its maze-like homes and towers are built over the water itself. 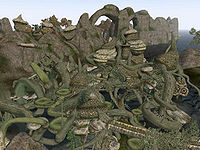 Llothanis was originally named Gah Ouadaruhn. 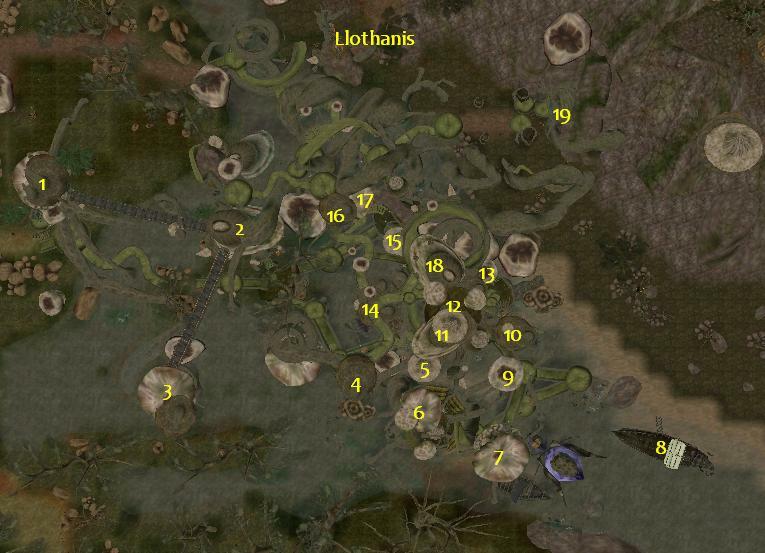 Support in Llothanis: The local people of Llothanis need some guidance from the Temple. The Weight of Guilt: Acquire this very heavy book for Silniel the Maven. A Beleaguered Pilgrim: Help protect a pilgrim on his journey. A Smuggler Found: A shady tavern in Llothanis is the perfect place for an espionage mission. A Tailor in Need: Help a tailor track down his missing supplies. Sarvanni Courier: Molecrab Eggs: For some extra drakes, deliver the molecrab eggs too! Sarvanni Courier: Molecrab Shells: Be a successful trader and deliver some molecrab shells. 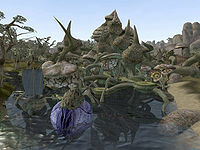 Temple Propaganda: It is dangerous to be a Tribunal Temple worshipper in the Telvanni lands. Find out why. The Prince of Plots: An honest noble from Llothanis was captured by an evil cult, or was he? This page was last modified on 6 March 2019, at 08:03.